A few weeks ago I popped back to Suffolk to see my parents (and to pick up some veg plants that had been growing in their polytunnel for me), my Mum was very excited to show me her vegetable patch. When I got there she unveiled a bean pole pergola which my dad had helped her build. Apparently it had been in one of the gardening magazines she had been reading. I took inspiration from this and decided I would build one as well! 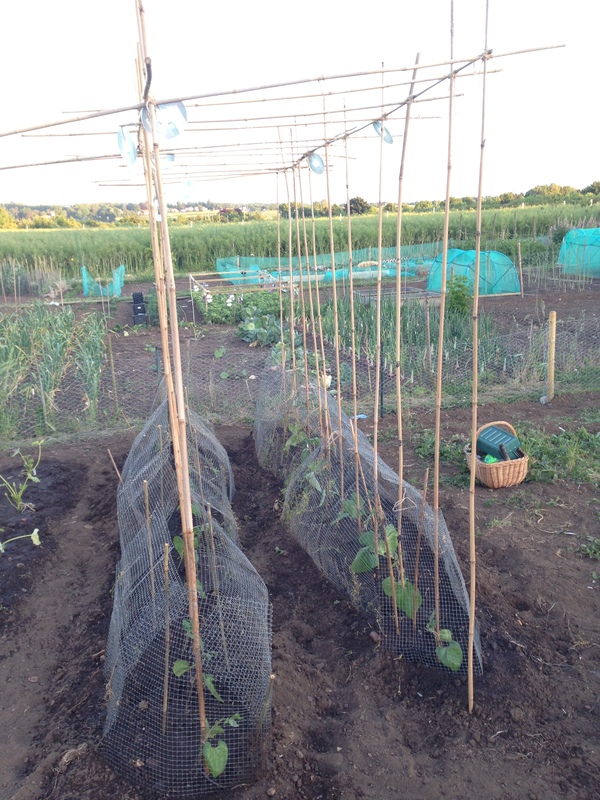 I would usually have gone for a tipee built of canes, but this style of frame means that you can walk around both sides of the plant and pick beans (if they grow! ), it also meant that we could cover them against possible pidgeon attacks. I’m not the best at building structures on the allotment, Oli (luckily for me) is the total opposite. He likes to make sure things are measured out properly and built so they won’t fall down. So with a bit of help from him (and his trusty tape measure) we soon had this lovely structure up and ready to go. The beans had been in the greenhouse up until now, I like to start them off under cover to give them a bit more chance of survival. Last year I put them out when they had just developed first leaves, the pidgeons loved them and with a day they were gone. So this year I have let them develop a bit more and covered them over so they have a chance to climb. We will probably uncover them once they get going, but for now its a great start. Fingers crossed we get plenty of beans. I’m looking forward to making some runner bean chutney already.